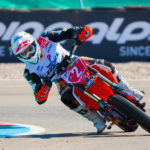 Guadassuar (Spain) 30 September 2018 – In warm and sunny conditions the race day of the 2018 FIM Supermoto of Nations started at Circuit de la Ribera in Guadassuar, Spain. With the sun out early, lots of spectators found their way to the racetrack near Valencia and the stands alongside the race track were full of Supermoto fans. Circuit de la Ribera is one of the best venues in Spain and all riders felt at home on the spectacular fast track giving the crowd some great shows. For the fifth time in a row it was Team France who took the victory in the FIM Supermoto of Nations in one of the best editions ever. In hot and sunny conditions the first race of the day in Guadassuar was for the riders of group one and two. The qualified group 1 riders had to start from the second half of the grid which meant that Team France rider Thomas Chareyre had to start from fourteenth position while his fellow countryman Laurent Fath started from pole position. At the start it was Team Italy rider Diego Monticelli who took the holeshot into the fist very fast corner of Circuit de la Ribera, but the Italian rider was passed immediately but Team France rider Laurent Fath in the second corner. Third position in the first corner was for Team Spain rider Joan Llados who has shown impressive speed all weekend. Behind Llados it was Team Czech Republic rider Milan Sitniansky in fourth place, followed by Team Spain junior rider Adrien Cervera. In sixth it was Team France rider Thomas Chareyre who had a great start from halfway the field. Estonian rider Eero Madisson had also a good start and was in seventh just in front of Team Sweden rider Hampus Gustafsson and Team GB rider Jamie Duncan. For Team Italy the first race turned out into a big disappointment as first rider Edgardo Borella crashed on the first jump into the off-road section. Borella tried to restart his SWM but after a few tries the Italian had to retire from the race before it started. In front of the race it was still Laurent Fath in the lead before Diego Monticelli. The Italian was all over the back of the KTM of Fath giving the Frenchman no room for errors. Milan Sitniansky on his turn got better and better into his rhythm and closed in on Joan Lllados of Spain. In lap four the Czech rider gave all he got and passed Llados for third position in the race. Sitnianksy however had to watch his back as the European champion of 2018, Thomas Chareyre was already behind and closing in fast. Chareyre also overtook Llados, his teammate at TM Factory Racing, in the same lap as Sitniansky did. Behind the top five the battle for sixth was close and tight as Adrien Cervera, Eero Madisson and Hampus Gustafsson were fighting for every meter of asphalt, but the young Spanish rider managed to keep his competitors behind him. In front disaster struck for French rider Laurent Fath. At one of the jumps his back wheel twisted and the young Frenchman had to reduce his speed not to destroy his wheel completely. Diego Monticelli immediately overtook first place in the race followed by Thomas Chareyre leaving Laurent Fath in third. The Frenchman tried all he could to keep the speed as possible but he couldn’t keep Milan Sitniansky and Joan Llados behind him. Halfway the race, two riders started to move forward through the field after their mediate start. Czech Republic rider Erik Provaznik and Team GB rider Davey Todd and by the end of the race they reached place seven and eight. The battle for the lead was full open as Thomas Chareyre closed in on every corner of the circuit on Monticelli. With four laps to go the Frenchman overtook his Italian teammate in one of the fast corners in Spain. Chareyre immediately started to create a gap and after eleven laps the Frenchman crossed the finishline in first position, taking the victory in race one. 4.871 seconds later Diego Monticelli finished in second, followed by Milan Sitniansky for Czech Republic. Positions four and five were for two Spanish rider, Joan Llados and Adrien Cervera. For Laurent Fath the race couldn’t be over soon enough, but the Frenchman the reach the finish line in ninth position. With nothing sure yet, race two will be again an great race. Race two started at 13:05 hours in the afternoon under a blistering sun and high temperatures. This time group two and three riders were on the start grid. With the group three riders on placed in the second of the half of the grid, action was guaranteed. At the start it was Team France rider Sylvain Bidart who took the hole shot in front of Team Italy rider Diego Monticelli and Czech Republic rider Milan Sitniansky. In fourth position it was Team Spain rider Ferran Cardus on his Suzuki followed by Team GB rider Richard Blakeman. Frenchman Laurent Fath had also a good start from fourteenth place and started the race in sixth position. The top ten was completed by Team Portugal rider Nuno Rego, second Team GB rider Davey Todd, Team Czech Republic rider Petr Vorlicek and Team Italy rider Elia Sammartin. In front Sylvain Bidart was very fast for the beginning, but the experienced Frenchman couldn’t get away from Diego Monticelli and Milan Sitniansky. All three riders were only a few meters apart from each other, fighting for every meter of asphalt of Circuit de la Ribera. Behind the top three, Laurent Fath was out for revenge after his technical problems in race one and was rapidly climbing up to fourth position passing Ferran Cardus and Richard Blakeman. Behind Blakeman, his fellow countryman Davey Todd was on the charge and after a short fight, Todd took over sixth place. Todd wasn’t done yet and set his sight on the fast Spanish rider in front of him. After a lap Todd had closed the gap and a great fight started between them. Every corner and every straight they changed position giving a great show for the spectators. Meanwhile for the leader of the race disaster struck and for the French team. A puncture in his rear tyre forced Sylvain Bidart to slow down giving a chance for Monticelli to pass him. The Italian rider didn’t waste any time and took over the lead in race two. For Bidart it was going to be a long race. Bidart managed to keep Sitniansky behind him for two more laps, but then the tyre went flat completely and Bidart had no other choice to try and finish the race. Sitniansky quickly passed him as the Czech knew that Lauren Fath was closing in rapidly on him. Just when the Czech rider started his attack, technical problems on his Honda made him lose speed making it easy for Laurent Fath to come closer and pass him. With Bidart dropping and dropping in the field, Fath had to defend the honours of France. Behind the top three, the fight was still full on for fourth place between Cardus and Todd. Both riders however had to watch their backs as Team Italy rider Elia Sammartin was full on throttle towards them. Sammartin pushed his Honda through the field and by the end of the race the Italian rider managed to take over sixth place from Petr Vorlicek and Team Spain rider David Gimenez. 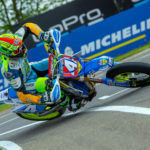 In front Diego Monticelli had a comfortable lead, but still Monticelli couldn’t afford any mistake as Laurent Fath was not giving up and still closing in. The Frenchman gave all he had but at the finishline he had to settle for second place. Diego Monticelli took the victory for Italy in race two with a lead of 3.922 seconds on Laurent Fath for Team France. Despite his technical problems Milan Sitniansky finished in third place taking valuable points for the Czech Republic. The big fight for place four was won by Spanish rider Ferran Cardus, only 00:201 seconds in front of his rival, Davey Todd who completed the top five. Team Italy rider number two Elia Sammartin finished in sixth, while Sylvain Bidart only scored an twenty-second place for France. With one more race to go Czech Republic is in the lead but nothing has been decided yet in this Supermoto of Nations. 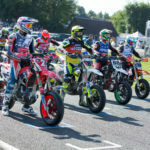 Last and final race of the 2018 FIM Supermoto of Nations was for the riders of group one and three. At the start of the final race it was Team France rider Sylvain Bidart who had the best start before Team Italy rider Elia Sammartin and Team Spain rider Jaume Gaya. Fourth position out of the first corner was for another Spanish rider Joan Llados, who was in his turn followed by Team Czech Republic rider Erik Provaznik and the second Team France Thomas Chareyre who had again a good start from fourteenth position. Seventh position was for Edgardo Borella for Italy. Petr Vorlicek, the second rider for the Czech Republic started the race from twelfth place. Straight from the start the top two riders started to get away from the rest, chasing and pushing each other to the limit but another rider was on the hunt. Thomas Chareyre moved up to third position in two laps and the Frenchman closed the gap towards Bidart and Sammartin rapidly. The battle for fourth place in this last race of the season was also close as the podium for all countries was still possible. The two Spanish riders Gaya and Llados were only meters away from each other making it a great race for the spectators to watch. Not far behind the Spanish riders, two other riders were also fighting for every meter of asphalt at Circuit de la Ribera. Erik Porvaznik and Edgardo Borella chased each other for laps and laps. The Czech rider didn’t give anything away but Borella was out for revenge after his crash in the first race. With three laps to go Borella passed Provaznik in one of the long corners of the race track and took over sixth position in the race. The second Czech rider is this race, Petr Vorlicek slowly but steady moved up the field and showed some good speed. Halfway the race, Vorlicek managed to overtake eight position from Swedish rider Hampus Gustafsson. Up front the battle was getting harder and harder. Thomas Chareyre closed the gap to Sammartin and Bidart. The Frenchman wanted more and opened the attack on Sammartin. Every corner the multiple Supermoto champion tried to overtake the Italian Honda rider but Sammartin didn’t give up so easily. Every attack of Chareyre was answered but an attack of Sammartin back at Chareyre. Because of this fight for second place, Sylvain Bidart managed to create a gap to them and got a more comfortable lead in the final race. Further down the field the position were more settled, with the Spanish riders Llados and Gaya still in fourth and fifth position, still very close together but Llados used his experience and finished before his younger fellow countryman. Right behind them three rider were chasing the last place on the podium. Edgardo Borella couldn’t get away from his Czech chasers but the Italian kept his head cool and managed to score sixth place in race three, only 00.140 seconds in front of Erik Provaznik and Petr Vorlicek who closed the gap completely but ran out of time to pass the riders in front of them. In the lead Sylvain Bidart was lose from Sammartin and Chareyre and finished the finish line in first place, 2.310 second in front of Team Italy rider Elia Sammartin who managed to keep Thomas Chareyre behind him. Team Spain and Spain junior completed the top five with Joan Llados and Jaume Gaya. 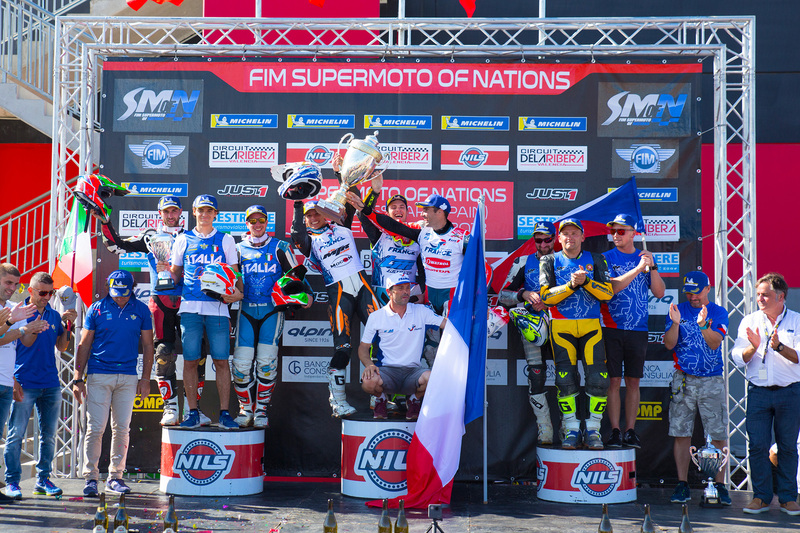 With the final race done it was again France who won the FIM Supermoto of Nations. 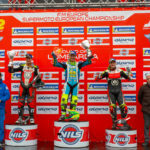 For the country it is the fifth time in a row that they win the FIM Supermoto of Nations. 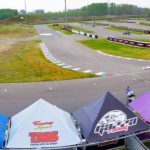 The Supermoto of Nations will be broadcasted delayed, by clicking HERE you will obtain the full tv list.